Reduce costs, manage claims and ensure business continuity with the smart notification platform. 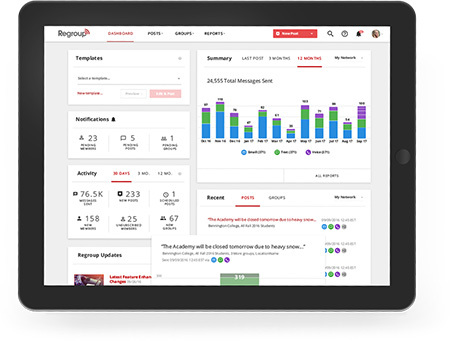 Regroup’s cloud-based notification platform helps insurance professionals overcome the challenges in reaching a mobile, geo-dispersed workforce, customers and stakeholders. Its automated NWS/NOAA alert feature can notify policy owners of severe weather – before property is damaged, thereby helping to reduce claims. And, its versatile API Suite can automate notification while reducing human error. Regroup’s QuickConference feature can be used to collaborate with agents, underwriters and other administrative personnel – reducing the costs associated with long-distance and fax communication. Use Regroup to deliver texts, SMS, voice messaging and email to specific locations with built-in geo-targeting. 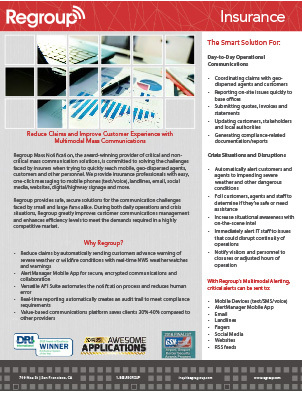 Regroup is the smart business solution for insurers wanting to reduce costs and manage claims. Its ease of use and robust features make it a perfect complement to your communication strategy while allowing you to maximize operational efficiency and mitigate risks. Regroup for Insurance – our fact sheet shows why a mass notification system is an essential tool for insurance companies, agencies and more.